I’ve also tried to sort the garden a little. Bit of a mammoth job, as it’s been a bit neglected (if it’s a weekend and it’s sunny, we go biking, not gardening), so it was a wee bit triffidy. It’s still not going to win any RHS awards, but it’s a little less “wildlife haven”. 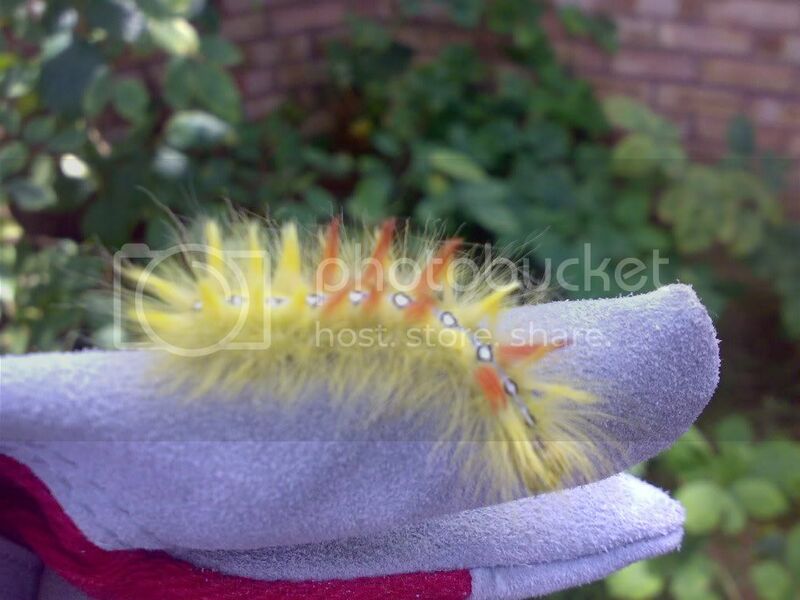 Yes, the Sycamore Moth caterpillar is pretty punk rock. It grows into a very dull brown moth, sadly. I think the more extravagant the caterpillar, the less interesting the adult flappy. He went back to live in the remaining weeds. Next weekend we’ll be Ooop North to visit Mr Toast’s parents, and will hopefully get some Dalby and North Yorkshire Moors rides in. It was the sixth (I think?) Big Build Day at the weekend. The plan was to continue working on the links between the Red Monkey to the Black Monkey. Fortunately, the weather was great, there was a good turnout of volunteers, and a good bulk of the work got done. Either I’m getting better at trailbuilding, or the conditions were slightly more favourable than the previous two Big Build Days. I didn’t hit any persistant black patches, anyway. Mr Toast had a slightly trickier job, as he had a tree stump that needed removing. There was quite a bit of digging, lots of manly grunting, and, at one point, three men wiggling the stump. Which sounds like a euphemism, but it’s not. There were a few roots that were so evil they actually had to be removed. Ian took to the roots with a pickaxe type thing – I think it’s called a Mattock? He seemed to quite enjoy it, particularly once it was suggested that the same technique could be used on people who ride closed trails. As we went down to lunch, Rob walked us down the original Monkey, which is going to be graded black. Sweet. Merciful. Zeus. The drops were mildly disconcerting, but I think it was the fat pointy root crossing the trail diagonally on a corner that did it for me. Unfortunately I’d left my Holy Water in my other trail building trousers, so the Evil Root remains. After partaking in the most excellent barbecue and cake (thanks Dale and Sharon! ), we went back and worked on another link near the exit of the Monkey. 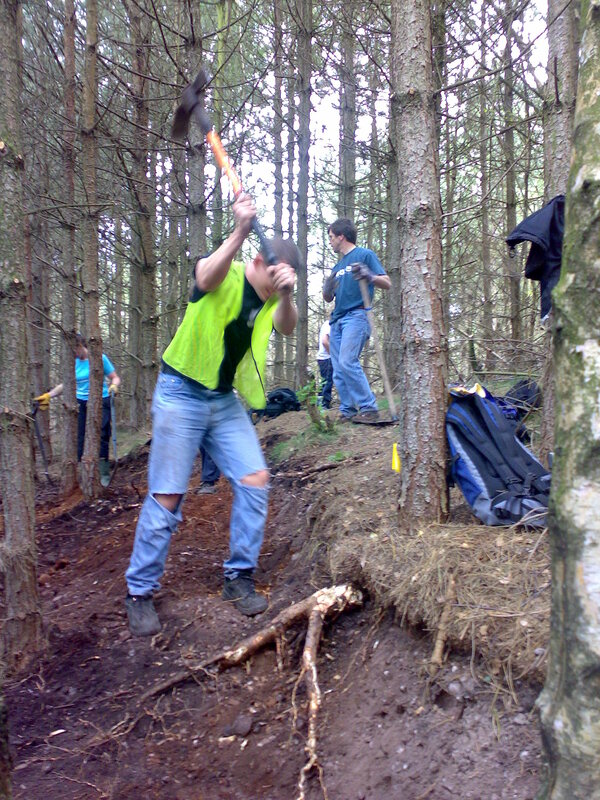 I mainly helped with keeping the existing Monkey clear of the debris being created by the new trail – due to the good turnout, digging spots were at a premium! There was some extreme brashing as it was decided that a couple of trees needed to come down – somehow people managed to restrain themselves from singing, “I’m a Lumberjack”. So, another successful build day under the belt – the next one is planned for October, I think. The recent and upcoming work does mean that the Monkey (which never existed) is now closed, so please – don’t ride it. As with FtD, and the rest of Phase II, the more people that ride closed trails, the longer trails stay shut for, and the harder they are to maintain. 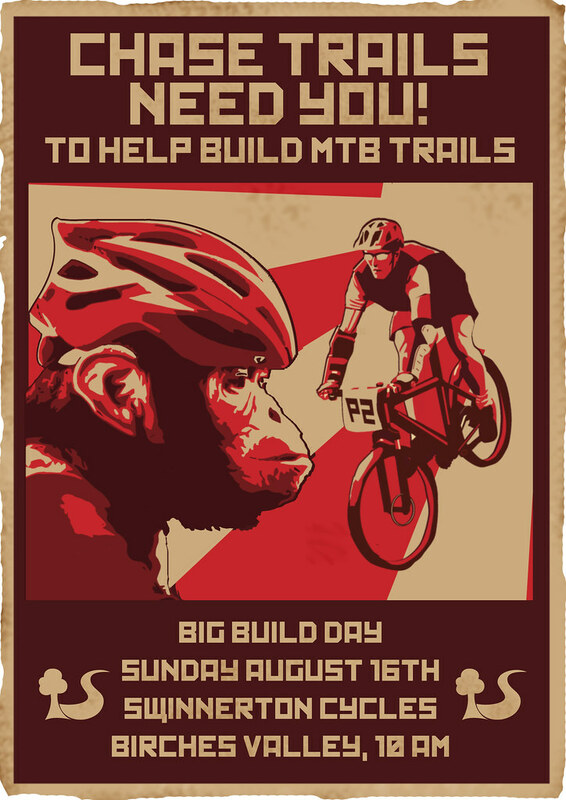 A reminder: August Big Build Day! I rode like absolute crap yesterday. Put a turd in a jersey, pop it on a bike, and there you would have a visual representation of my performance! It had all started out so well – the sun was shining, the trail was slightly drier, and I was in a good mood. This lasted for about 2 minutes into section two. I was actually zipping through at a decent pace when I didn’t quite manage to get through two trees as I’d planned. I clipped the handlebars on a tree to the right, and off I came. I brushed myself down, got back on the Professor, and, slightly bemused, set back off again. I managed to regain my flow pretty well, but lost it again on the last switchback. As I went into the turn I heard the squeal of brakes of someone on my tail and panicked. Result – I fell off. Again. Picked myself up, got back on the bike. I got to the end of section two, and could I ride the exit? Could I hell. Well, I probably could have done, but I kept hitting the brakes on the first step and putting my feet down. I’d already began to worry about those particular rocks due to the dark mutterings on t’internet about rear mech destruction – given that I’m fairly lacking in skills, I’d be a likely victim. This already slightly negative mindset was amplified by the fact I’d fallen off more on one section than I normally do on a normal lap. Hell, I usually manage to do the entire thing without incident. I was determined to do it, but after fifteen or so attempts, I had to concede defeat. I rode the entry into six fine, slightly fumbled the turn from the rocks onto the bridge, and carried on. Rode the rest of six fine, followed the diversion, and had a grumble as I passed the end of section 7 – the orange netting that closed it off was in a bush, presumably ripped down. I put it back in place using McGuyver like-skills, and hoped that it was actually ripped down by nefarious means, and that I hadn’t accidentally closed in some innocent trailbuilders. On section 8 I’d lost my mojo – whereas on my last ride I felt that I’d ridden steadily but in control, this time I felt I was riding slowly and likely to fall off at any given moment. Walked half of the jumps on eight, walked the exit ramp, and by this point was severely tempted to write off the day as a bad ‘un, and just pootle around the greens. But I persevered, and went on to nine. I fell off again, this time with an audience of five people, as I turned into the trail. Again, I heard the familar sound of someone approaching fast behind me, and I looked around to see how close they were. The answer was ‘very close’, and I also found out that looking over your shoulder whilst taking a very tight corner leads to weighting distaster. Bike slid out to the right again, and I was on the floor, swearing loudly. After apologising to the family for the language and letting the bloke know that I was OK, I got back on the bike and carried on. I actually did the next couple of sections OK, managing to catch up with and overtake someone that had overtaken me on a previous section. I was still in a foul mood, however, so Evil Root Number Two was obviously a no-go. I rode section 13 a lot slower than I’d normally do, which gave me time to ponder how well it had dried out. Mr Toast caught up with me on section 14 – he was on his second lap. This section was notable for its awesome wildlife. After stopping to safely move a rather large, green, hairy caterpillar off the trail and into the foliage, we got to the top…and there were lizards! 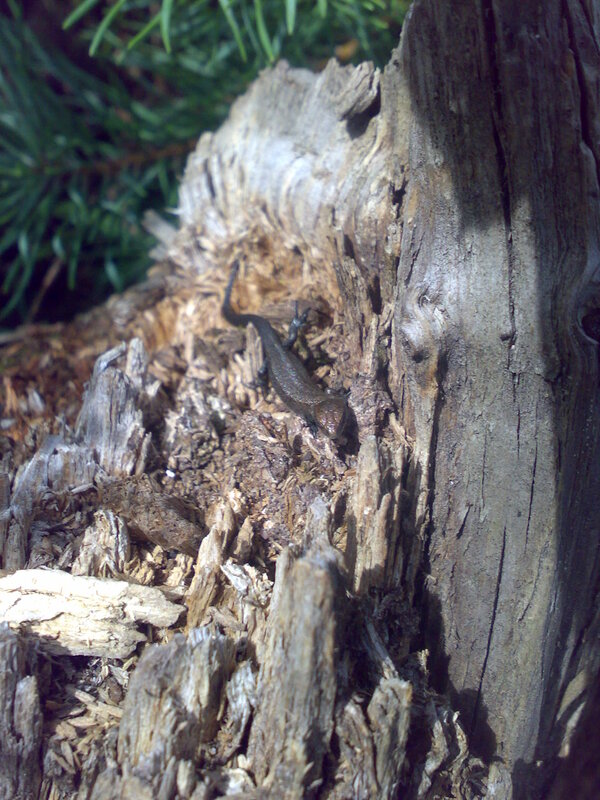 I believe the cheeky chappies were male common lizards. 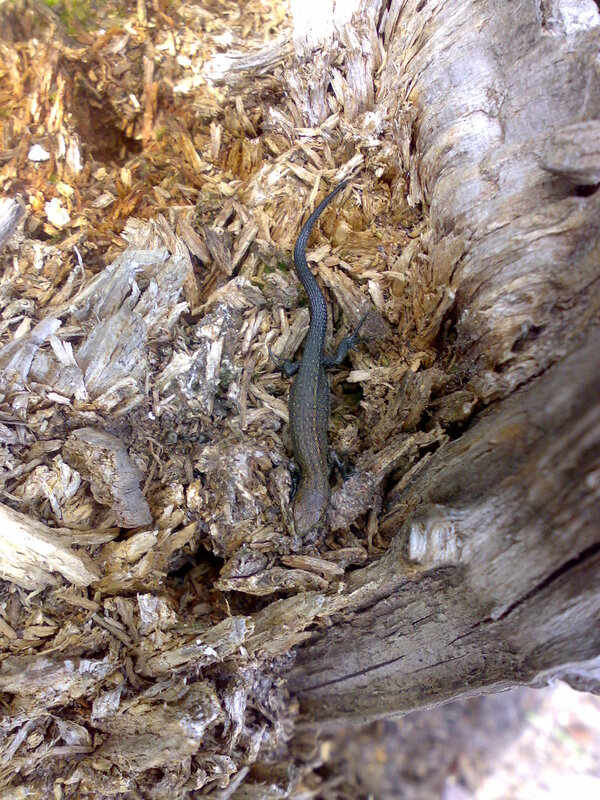 The second lizard had a stumpy tail – common lizards can detatch their tails when grabbed by a predator, leaving the predator confused whilst the now tailess lizard can make good his escape. The tail grows back eventually. Suddenly the day was all worthwhile! Did 15 without incident, still pretty slowly though, and decided to leave 16. I was feeling pretty miserable, so I decided that it’d be far more productive to sulk in the café over a cookie. Meh! Post ride food snaffled: Tea, ham sandwich and a cookie. Good dogs seen: A Jack Russell, two border terriers and a boxer dog. If you’re in any of the photos and are desperately mortified about being on t’internet, let me know and I’ll take down the picture. Or Photoshop a kitten’s head onto your shoulders, one of the two! Unfortunately we didn’t actually get out on the bikes this weekend. On Saturday we both felt pretty rough (hooray for summer colds! ), and the weather was utterly miserable…yet again. Ended up staying at home playing videogames all day. Only the plus side, I hit Revered with the Sons of Hodir in World of Warcraft. Bet you’re jealous. Sunday was more productive – we helped marshall the Midlands XC race over at Cannock Chase. The weather was actually fairly decent, with some sunny spells, but fortunately it had been raining heavily for the past couple of weeks, so the track kept to tradition and was nice and muddy. We were based by ‘The Berm of Death’ in the morning, which has a steep descent into it – that, combined with the mud, led to a fair few people sliding off sideways or walking down! Massive respect to all of the riders though. I’ll post up some pictures tonight!